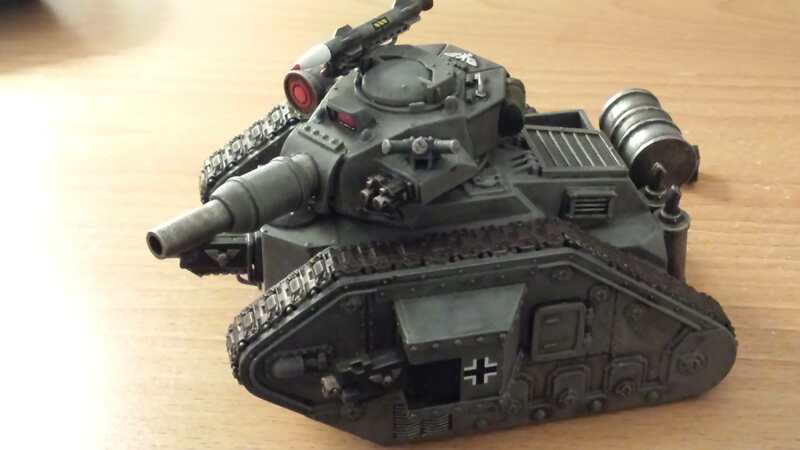 Anyone know where I can get some leman russ conqueror turrets? I know forgeworld haven't made these in ages. Is there any other place to get these or stand ins? Not really. You could convert something from a regular turret and a storm bolter. There are probably elicit ways to get one, but we can't talk about that here really. I have seen them turn up on eBay. Victoria miniatures does a conqueror variant with one of their tank turrets. You could just cut down the regular Battle Cannon, the Conqueror's just a snub-nose BC anyway. Not quite, it also has a coaxial Storm Bolter. Still, convertible. Wasn't there also a version that had a coaxial heavy stubber instead of the storm bolter? I know there was a Vanquisher like that. A Conqueror with 2 Heavy stubbers and 3 heavy bolters would lay down a good amount of dakka. It might have been replaceable in one of the rule sets but the FW turret had the coaxial stormbolter as a fixed part of the build. "Remember, Orks are weak and cowardly, they are easily beat in close combat and their tusks, while menacing, can easily be pulled out with a sharp tug"
Ah ok. In that case I did something similar with a Vanquisher conversion and a Heavy Stubber; you need the old-style turret which had that chunky ammo box/storage container on the left side, and just integrate the weapon into that. I don't have pics at the moment but the Storm Bolter would be mounted to the turret itself rather than having to construct a true co-axial mount. Outside of rare ebay pulls or using the shapeways one you could probably convert one with a bit of effort. this is the older lemon kit though but the basic concept should be the same, cut the battle cannon short, plastic card or greenstuff the side wing for the storm bolter and some kinda light or sensor bit on the top. Alternatively the demolisher kit may have just enough realestate to put a cut down battle cannon and storm bolters to one side.